We seem to be experiencing the largest emergence the swallowtail moth (Lyssa zampa) since 2005. Interest in this phenomenon has appeared in social media, blogs [1,2] and the press[1,2], and even in Malaysia [1,2]. This bumper tranche of Singapore Biodiversity Records features two back-dated natural history documentation of Lyssa zampa in 2005 and 2008. In 2005, Dr. Leong Tze Ming observed caterpillars feedings on the bulan-bulan tree (Endospermum diadenum) in the Central Catchment Nature Reserve, and subsequently, the metamorphosis of the moths. Then in 2008, Leong and the museum’s collection manager, Kelvin Lim, found a mating pair at Bukit Timah Nature Reserve. 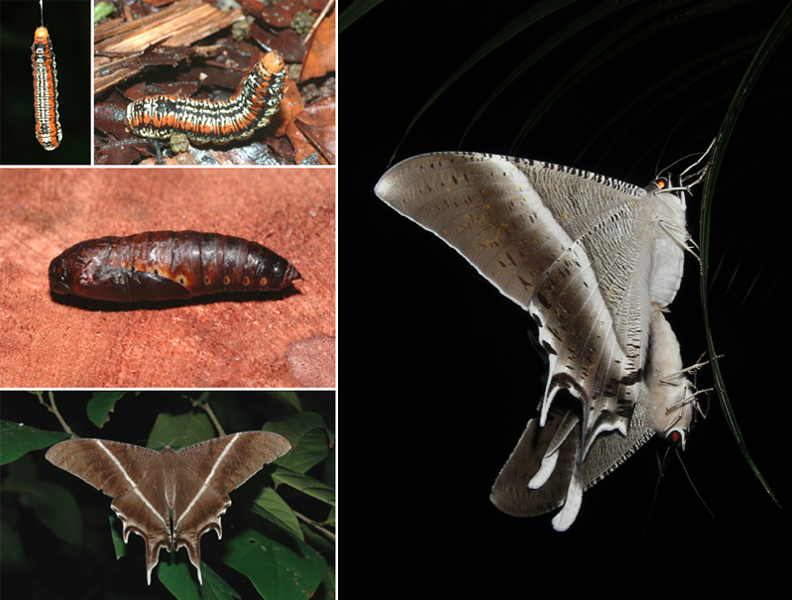 Lyssa zampa metamorphosis (left; photos by Leong Tze Ming) and copulation (right; photo by Kelvin Lim). Both of these records appear to be the first time that mating and metamorphosis has been documented and published in Singapore. The seasonal appearance of this distinctive moth has also led to two citizen science and crowdsourcing efforts. Museum research affiliate, N. Sivasothi, is collecting sighting records of Lyssa zampa, while Nature Society (Singapore) butterfly interest group members are encourating members of the public to plot their sightings on a shared map. If you see Lyssa zampa, report your sightings at http://tinyurl.com/habitatnews-records and https://mapsengine.google.com/map/edit?mid=zagFYImIHI3c.kdqh62BZXPXs.